Has your lawn been taken over by moss and weeds? Are you looking to start again with a fresh new lawn? Call Abbey Landscapes and Turf today on 02380 812302 and purchase your garden lawn turf from us. With many years of experience, we are well-equipped to provide you with that lush green lawn that every homeowner wants. With lawn turf to suit all garden types, we are sure to have the right product to suit your needs. If there’s one surefire way to spoil the look of any garden; it’s the sight of a lawn that has withered and died or been taken over by weeds and moss. When this happens to your garden, don’t despair, simply pick up the phone and give the friendly team at Abbey Turf a call. 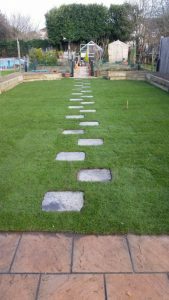 Whether for a new garden or a renovation project, our garden lawn turf simply cannot be beaten for quality or affordability. As a rule, we never compromise on quality – and neither should you! Our garden lawn turf comes in several varieties from lawn to show turf. Whether you’re looking to showcase your garden or simply enjoy the wonders it has to offer, we’re sure to have the right turf for you. How can Abbey Landscapes and Turf be of assistance? 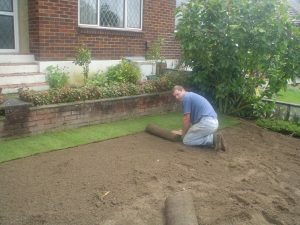 To help you get the most out of your garden, we are on hand to provide you with honest and impartial advice on the best turf to suit your needs. We grow the finest garden lawn turf on our 180-acre site, so we are able to supply the right amount for gardens of all sizes. All of our rolls of turf are supplied by the metre so you have complete freedom over the amount that you order. So we can maintain the strictest quality controls, we never supply lawn turfs that have been sourced from external suppliers. We grow all our own turf so you can be confident that you’re receiving a product that is of the highest standard. Plus, we don’t use netting as we feel that this stumps the growth of our garden lawn turf resulting in an inferior product. Instead, all of our turf is grown in the finest sandy soil which provides the best environment for growth. All turf is inspected by our team on a daily basis to ensure zero weed growth and that all grass is healthy. Placing your order couldn’t be easier, and once completed, your garden lawn turf will be freshly harvested and delivered within 24 hours by either crane or forklift. What other products do we supply? To read more about our garden lawn turf as well as our other products, click here. Do you lack time to give your garden the TLC it deserves? Not a problem, as we also provide professional landscaping services. From water features, decking and fencing to drainage and turf laying, our team will supply you with the garden that you’ve always dreamed of. So, if you have any questions about our lawn turf garden services, do not hesitate to get in touch now. Choose Abbey Landscapes and Turf today as our team provide complete value that you can trust. As the most reliable supplier of lawn turf garden owners have encountered, we have set the standard for delivering quality products. In fact, we are the leading local supplier for domestic, commercial and trade customers with all enquiries welcome. From private residences to golf clubs, local authorities and even the government, no order is too demanding for our team to fulfil. With 25 years of experience to call upon, our record for delivering garden lawn turf on time and in full is unrivalled. Our deliveries are flexible, and we always supply an exact date and time, so you’re never left waiting around. Plus, we strive to remain as competitive as possible. When you choose Abbey Landscapes and Turf, you can be confident that you’re receiving the most affordably priced lawn turf garden owners have seen. Call Abbey Landscapes and Turf today on 02380 812302 and place your order of garden lawn turf with our helpful team.